Kavita has been instrumental in evolving how WWF harnesses the power of the market to deliver conservation outcomes. WWF International is pleased to announce that Kavita Prakash-Mani has been appointed as the organisation’s new Global Conservation Director. Since joining WWF in November 2016 as its Markets Practice Leader, Kavita has been instrumental in evolving how WWF harnesses the power of the market to deliver conservation outcomes. 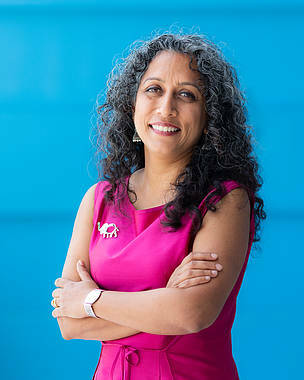 In addition to pioneering new approaches to shift consumer demand for illegal wildlife products in Asia, tackling the plastics crisis, and providing market access for sustainable community based products from critical habitats, Kavita has helped further develop WWF’s strong work in building corporate demand for sustainable commodities and linking it to landscapes. In 2017, Kavita also took on the interim leadership of WWF’s Food Practice. WWF International Director General Marco Lambertini said: “After an extensive search over the last six months, I’m delighted to announce the appointment of Ms. Kavita Prakash-Mani as WWF’s Global Conservation Director. This role is critical in driving the organisation’s strategies, developing and implementing our key initiatives, and ensuring integration and alignment across WWF to achieve conservation impact globally. Prior to joining WWF, Kavita founded and was Executive Director of Grow Asia (a WEF initiative) in Singapore, worked as the Global Head of the Food Security Agenda at Syngenta International, and as Executive Director of SustainAbility in London. She has also worked at the World Resources Institute in Washington DC, and Glaxo SmithKline in India. Kavita is an advisory member on influential boards such as the Unilever Sustainable Living Plan Advisory Board, the Advisory Board of SustainAbility Inc, and Volans. She is also a member of the Tropical Forest Alliance Steering Committee. Previously, she was a board member of the World Economic Forum Global Agenda Council on Food Security and Nutrition and the Institute for Human Rights and Business. Kavita will be based in New York, and commences her role on 1 February. She will also be a member of WWF International Senior Management Team. To find out more about WWF''s conservation efforts, click here.